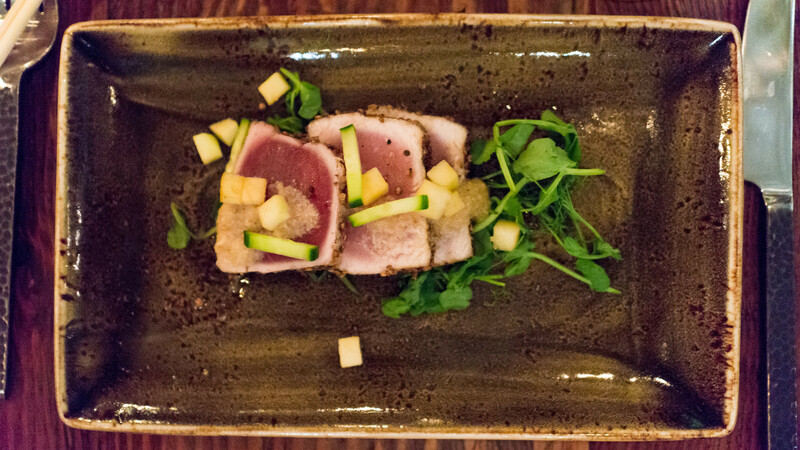 Next: tuna belly, in the form of a toro tataki. 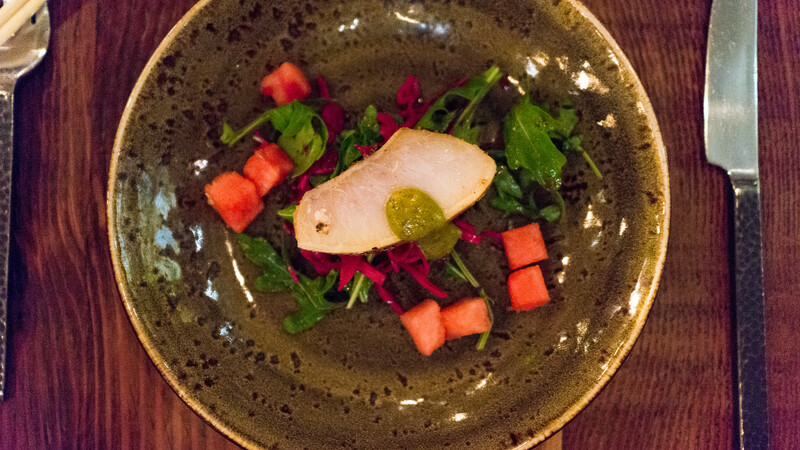 The seared slices of fish were dressed with a kalamansi ponzu sauce and paired with batons of snappy cucumber and diced apple (? I'm guessing. It could have also been pear, or possibly even jicama compressed with some fruit juice) and wispy pea tendrils. 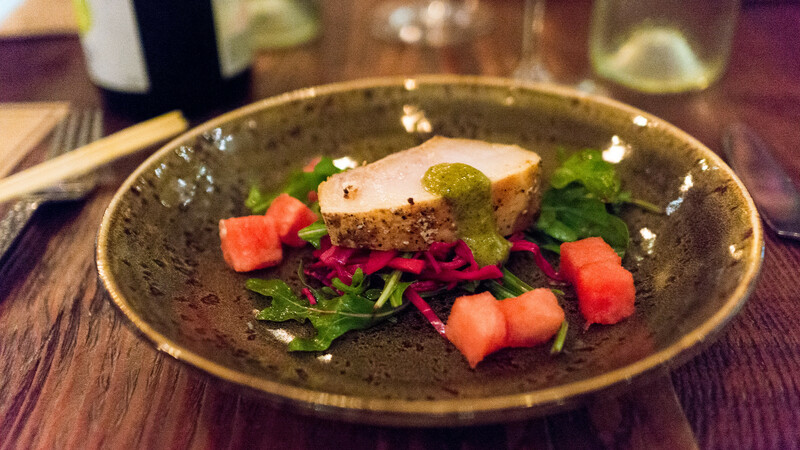 Belly number three: swordfish, cured in pastrami spices and served over a bed of pickled red cabbage, with some cubed watermelon as well. I loved the idea of this, and the shtetl-inspired combination of pastrami spice and pickled cabbage; unfortunately my piece of fish was very firm and grainy. I asked several other diners about this dish, with diametrically opposite responses: some people said theirs was silky and lush; others said it was unpleasantly tough. It definitely seems that the execution was inconsistent, which is unfortunate as it would have been a really nice dish otherwise. 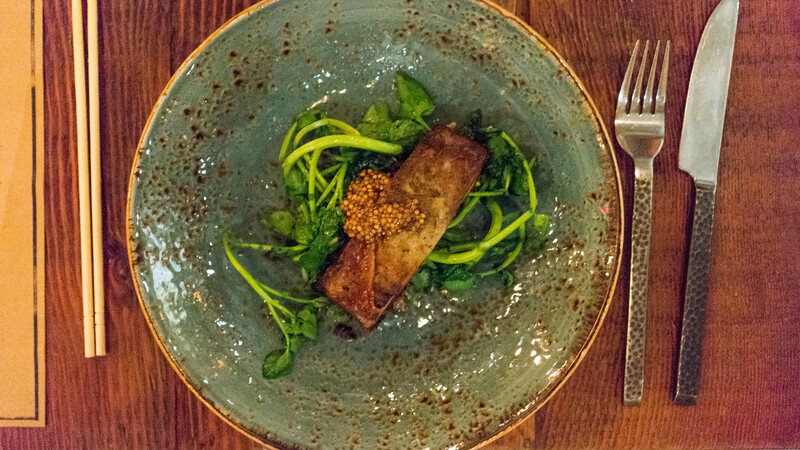 Lamb belly was the featured item of the next course, slow cooked and then crisped on its edges, topped with pickled mustard seeds and served over a wilted watercress salad. Lamb belly can be a tricky cut – when it's good, it's got the unctuousness of pork belly plus the rich, deep flavor of good lamb – but it can also be overly fatty or tough. I got lucky with mine, and enjoyed the cutting brightness of the mustard and greens against the lamb. My favorite dish of the night was Chef Yeo's version of a Korean classic: bi bim bap. 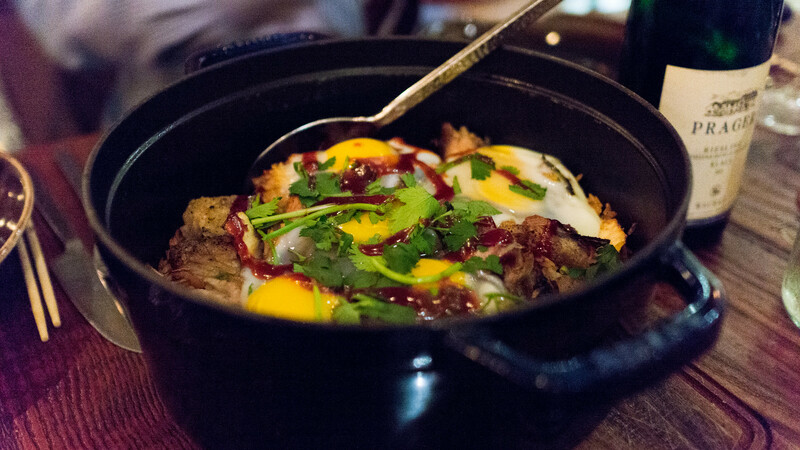 Hers, served up family style in a big cast iron pot, featured rice studded with kimchi and big cubes of pork belly, topped with several gooey eggs and a generous lashing of gochujang, that magical Korean fermented chile paste. The hot cast iron even crisped up the rice at the bottom of the pot, just like the stone bowls in which the dish is traditionally served. I kept on going back for more, especially those crispy edges clinging to the pot. 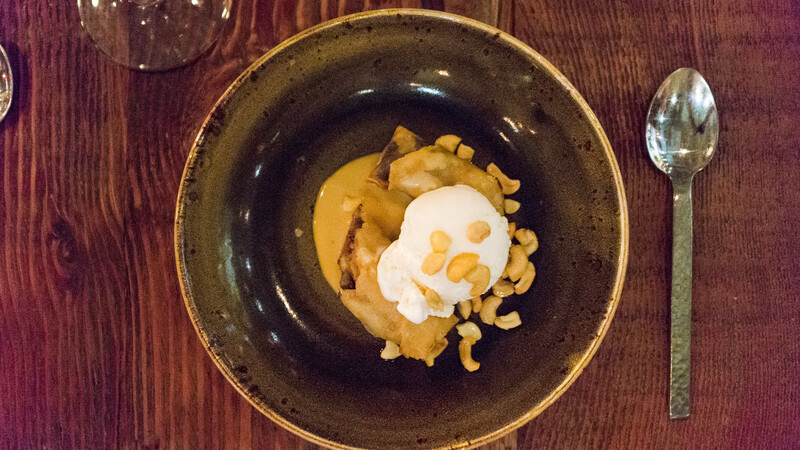 For a finale, Chef Yeo's dessert went "Straight to your Belly" (that's what she called it): banana filled spring rolls, served with vanilla ice cream, a scattering of toasted cashews and a drizzle of dark chocolate sauce. Sticking with the theme, our "mignardises" consisted of a little bag of Jelly Bellies sourced from Dylan's Candy Bar nearby on Lincoln Road. 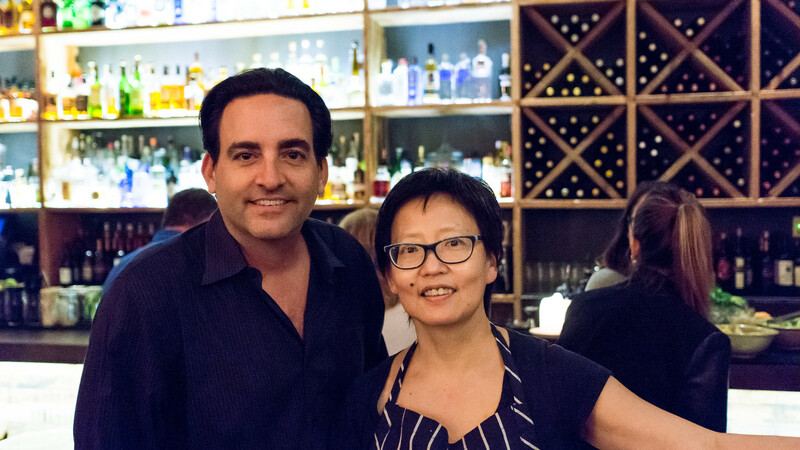 A hearty thank you to Chef Patricia Yeo and all of her team at Khong River House and 50 Eggs for putting this dinner together; and as always most of all, to the guinea pigs whose interest and support make these kind of events possible. A pause here, where I have to set aside my Cobaya oganizer hat and don my objective writer hat: this just wasn't what most people would think of as "toro," or fatty tuna belly. There are no visible striations of fat and indeed it tasted quite lean. That's not a knock on the dish, just the description. But it highlights a bigger issue that we've been thinking about quite a bit lately at Cobaya headquarters. We are very conscious of the fact that these dinners have become increasingly expensive. While our pricing always seems higher because we include tax and tip (this $110 event is really the equivalent of an $85 dinner before tax and tip), we're still very aware that this is a big ticket for most folks. And while we've never pitched Cobaya as something for bargain-hunters – we're not Groupon – we do want to feel like we are delivering a decent value. 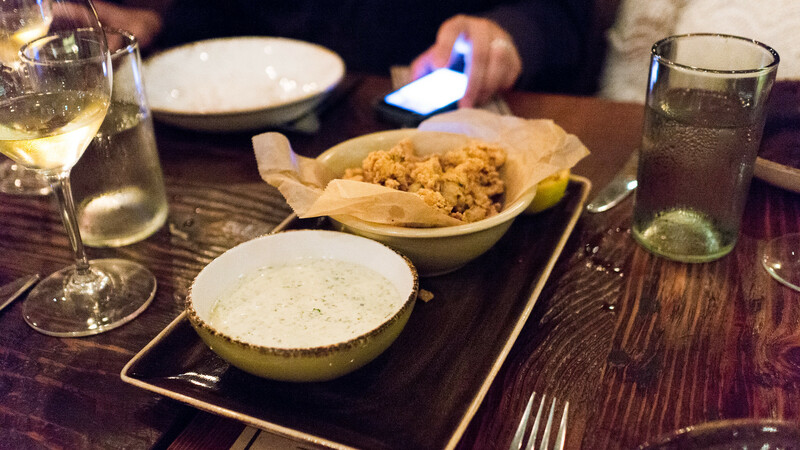 If you're paying $100+ for a dinner, we want to make sure you feel like you've gotten your money's worth. We'll be paying even more attention as we plan future events.